Parents, please tell me, you save Box Tops for your children's schools? They're like free money that goes towards the schools! I recently turned in a baggie half full (40 something) of box tops for our Elementary. Every year 24 million parents and children join in clipping Box Tops to support their local schools. As a result, SuperValu shoppers helped participating schools earn more than $10 million in the 2008-09 school year alone! 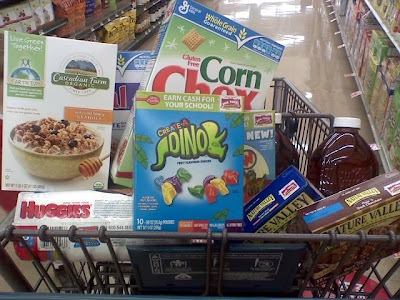 Click here for a list of participating Box Tops products! 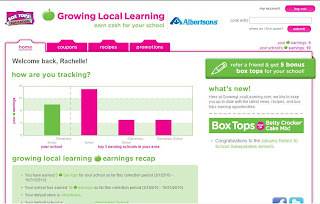 To make it even easier to participate in the program, the SuperValu family of stores (ACME, Albertsons, Cub, Farm Fresh and Jewel-Osco) joined Box Tops for Education in creating a website that not only tracks your Box Tops contribution and the school’s redemption, but also offers recipes, coupons, store promotions and more. From now through May 31, SuperValu stores and Box Tops for Education are giving you a chance to win 50,000 bonus box tops for your school. That’s a $5,000 value! 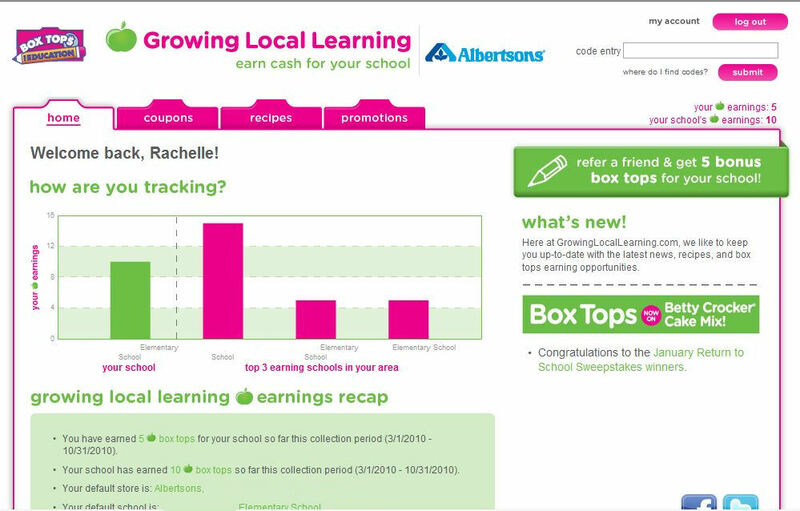 All you have to do is register at http://www.growinglocallearning.com/, and click the link to the 50,000 bonus box tops sweepstakes*. You will automatically receive 5 Bonus Box Tops just for signing up! *Please note that the sweepstakes is void in some states. After you’ve entered the sweepstakes, be sure to stick around and browse the website where you’ll find a variety of great offers on your favorite General Mills brands including Betty Crocker®, Old El Paso®, Totino’s® Pizza Rolls® and Pillsbury®. Once you register you can also find recipes that will earn you even more Box Tops and you can access coupons for the latest deals at your local SuperValu store! They will post special promotions on the site where you buy a certain product, and get bonus box top rewards at the store check out! (this week ours is Betty Crocker cake mix and frosting that earns 2 extra box tops!). ONE "Mommy? I'm Hungry!" reader will win a $25 American Express gift card courtesy of SuperValu & MyBlogSpark! 1. All you have to do is tell me how many box tops you think you'd be able to accumulate with your savvy shopping skills! I bet by watching the sales and using coupons you can score much bigger than I did! This Giveaway ends: 11:59 pm pst, Monday, May 17, 2010. I wrote this review for "Mommy? I'm Hungry!" about SuperValu. I received a free gift card to keep for this review & for a giveaway from SuperValu through MyBlogSpark. All opinions for this review are that of myself & family. Product info & stock images provided by PR. I think I could get 25 items with box tops on them. Thanks! My guess is 30 box tops. 15 maybe-- I'm not the most savvy shopper....Maybe I shouldn't admit that! I just sent in 27 to my daughters school today! Um.. probably not that many. Don't buy too many of those products unfortunately. Thanks for the giveaway though. my guess would be 20-25,I am always collecting them from everyone for my sons school! I could probably nab about 20. My dh loves cereal ( he can eat cereal for bf, lunch and supper and be happy)so I'm always on the lookout for special deals. I am following you on twitter @tracylr233 thanks! I could probably collect 20. Im saying around 25...We buy cereal on sale ALLL the TIME. I WANT THIS!!! I think I could accumulate 25 box tops. I'm going to say I could definitely accumulate 12-15 Box tops with $25! I think I could get between 15-20. I think I could get at least 20 box tops. 25 easy. we collect them all the time. the kids know where to look and want to cut them before the food is gone. My son's school just had a contest with the classrooms and he turned in 5 sheets of 25 each! He went around to our neighbors that don't have kids in school and showed them what the box tops look like and asked them to save them for him! 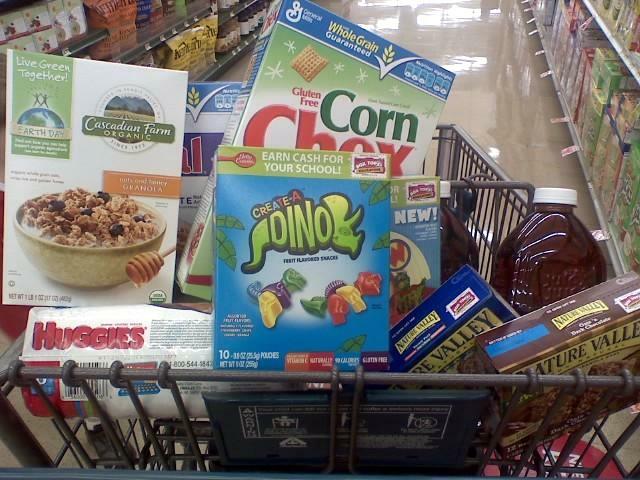 During a regular shopping trip I probably average 20, so adding in other people's box tops really helps!